Have a question about the Armor Double Regulator Backpack? Protect both your buddies and your regulator with this double regulator backpack by Armor. With two regulator set ups inside you can make carrying easy and hands free by wearing it as a backpack with the hide a way contoured padded backpack straps. Also has a convenient shoulder strap feature along with briefcase style handle. Bag also has a sleeve feature that will allow it to be slipped over the telescoping handle of a large roller bag. Bag is made to protect with it's over one inch of foam padding on each side. 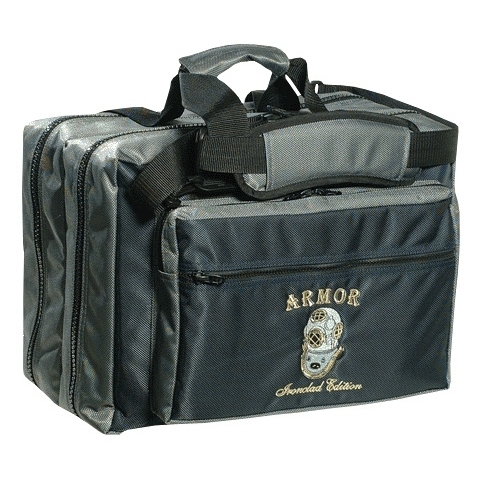 Bag is made from durable and strong 1680D Ballistic Nylon and 100% non-corrosive components. With two exterior pockets for extra items or travel document and the main compartment is divided into two separate compartments for extra protection of both regulators. Holds 2 sets of regulators and dive computers. External Dimensions 15.5 x 11.5 x 10"
If you have more than one rig, than this is the bag to get... I have two. I bet it would meet or exceed military specifications. In fact, a retired SEAL I used to dive with had one for his personal use and said it was one of the best made bags he had ever come upon. No need to recapitulate the list of features on the Description tab...  but they left out one useful feature... there are drain grommets for each rig compartment that speed the drying process.